Not one, not two, not three but FOUR dimmer knobs! This is one multi-talented light switch. Not only does it perform brilliantly, it does it in sheer style too. With its super-chic matt black plate and cool knurled dimmer knobs, it’s a shining example of form and function in perfect harmony. There’s no other word for it – this is a beast of a switch! Behind its cool, calm and collected exterior are the workings of genius. 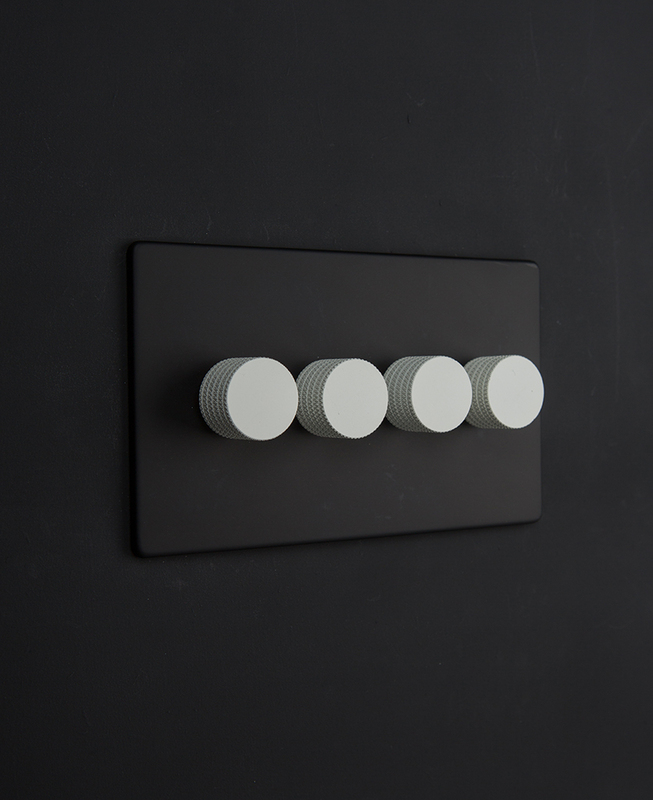 This dimmer switch may look stylishly simple, but it controls four different lights all from this single plate, how clever is that? This means you can control the ambience of your room literally to the nth degree. Twiddle and tweak the knobs throughout the day and evening to get the optimum light balance. 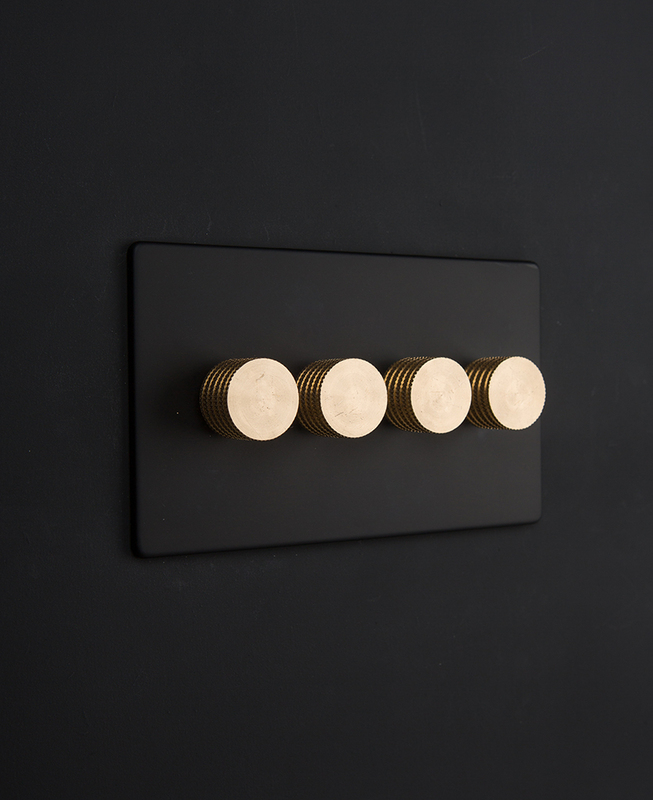 We love this quadruple dimmer switch in all black for a really sleek and sultry look, but if you fancy mixing it up a little then have a look at the gold, silver and white knobs. Whichever option you choose it’ll look fantastic against moody colours – think dark grey, navy or even forest greens. And because this black dimmer switch is sleek and unfussy in its looks, it makes it a great choice for busy rooms like kitchen-diners. It also sits brilliantly on pattern and texture – think exposed brick, polished concrete or some snazzy wallpaper. 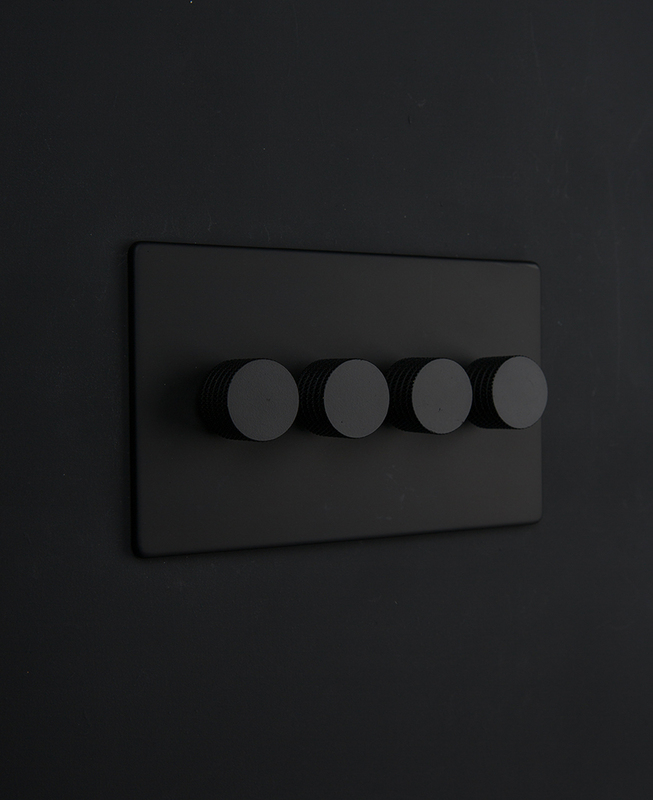 If you love this switch then have a look at the rest of the black switches and sockets range where you’ll find more dimmers, toggle light switches, appliance switches and USB sockets. And if you could do with a bit a refresher course on the difference between 1, 2 & 3 gang plus when to use 1 way, 2 way and intermediate switches then check out our guide light switches explained. For best results, we recommend that you use our own LED bulbs with our dimmer switches. Our bulbs have been manufactured and tested specifically to be dimmable with our switches and we can guarantee compatibility. Whilst we have tested selected bulbs from other leading manufacturers we cannot guarantee that all will work – this is due to differing technologies used within the bulbs.